* provides comprehensive data on all major organizations in the region. * Introductory essays cover topics relating to the region as a whole, including: Arab-Israeli Relations 1967-2003; The Jerusalem Issue; Documents on Palestine; The Removal of Saddam Hussein and the 'Deconstruction' of Iraq; The Islamist Movement in the Middle East and North Africa; Natural Gas in the Middle East and North Africa; Oil in the Middle East and North Africa; Islamic Banking and Finance and The Religions of the Middle East and North Africa. 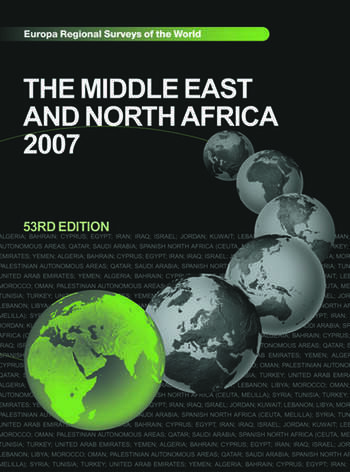 Individual chapters on each country containing: articles on geography, recent history and economy; an economic and demographic survey using all the latest available statistics on population, agriculture, industry, finance, trade, transport, tourism, and education; directory sections with names, addresses and contact numbers covering the constitution, government, legislature, judiciary, political organizations, diplomatic representation, religious groups, the media, finance, trade and industry (including petroleum), and tourism. * bibliographies of books and periodicals covering the Middle East and North Africa.